by Albert Bifet, et al. 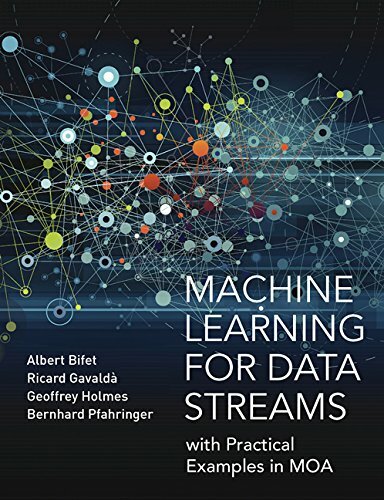 This book presents algorithms and techniques used in data stream mining and real-time analytics. Taking a hands-on approach, the book demonstrates the techniques using MOA (Massive Online Analysis), a popular, freely available open-source software framework, allowing readers to try out the techniques after reading the explanations. Contents: Introduction to Machine Learning; Linear Regression; Nonlinear Regression; Quadratics; Basic Probability Theory; Probability Density Functions; Estimation; Classification; Gradient Descent; Cross Validation; Bayesian Methods; and more. This text is designed to be a graduate-level introduction to probabilistic programming. It provides a thorough background for anyone wishing to use a probabilistic programming system, and introduces the techniques needed to build these systems. Gaussian processes provide a principled, practical, probabilistic approach to learning in kernel machines. The treatment is comprehensive and self-contained, targeted at researchers and students in machine learning and applied statistics.